Fulfilling, comfort food it is, I promise!!! Firstly, I washed and cleaned the chicken. Lowering the heat slightly (between medium and high), I covered and cooked the chicken, flipping every 6-7 minutes. Totally, it took about 12 minutes on each side – approx 24 mins total. If I had used boneless, skinless chicken as originally planned, it would have taken half the time! But the advantage of this was that it was juicier. It’s done when the inside isn’t pink anymore (poke it with a fork to check) and the outside is nicely browned. I let it it charr a little because that’s how I like it!! I took the pieces off the pan and shredded the meat off the bone, using 2 forks. (If you use the breast, then just slice thinly). Place a cheese slice on each of the halved burger buns and place it in the oven to toast for 5 mins. While they’re toasting, mix together the coleslaw and pico de gallo. For the coleslaw, I placed the cabbage, green chillies, mayo, salt, pepper, mustard in my measuring cup (I have no idea why I always make coleslaw in the cup!!). Before I added the cilantro and lemon juice, I admired the cilantro for a minute. It brings such joy to my heart!! I don’t know whether it’s an “Indian” thing or a PK thing!! Then I mixed it all up and transferred it to a bowl. 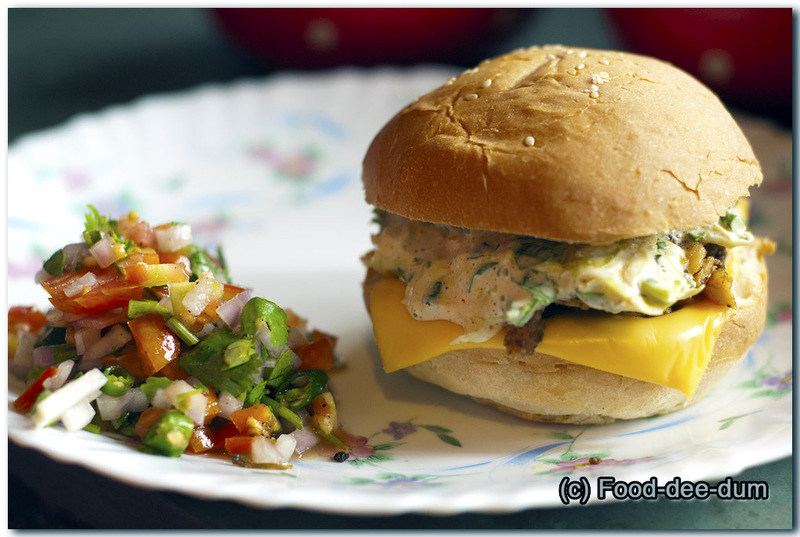 There you go… Perfectly easy and flavourful sandwich for lunch! !